Application for Government Quarter for employees, officers, teachers, grade officer, police officer, income tax officer, protocol officer, clerk, naib qasid etc free download and change for your needs. This application is to request a Government Quarter. I had been recruited as assistant clerk in National Identification Department two months earlier, but have not been allotted a government quarter till now. The provision of such quarter was mentioned in the job agreement. I request you to allot me a quarter as soon as possible to maintain my motivation at work. I am Malika Elkawa, Irrigation officer of grade 19 of Sindh Government since 10 years. I belong to Hyderabad which is my hometown city as well but my job placement is in Kerala city. Kerala is far away from my home and it is impossible to travel daily for 200 KM to reach my office. I am married with two kids so it is impossible for me to stay here in a rented residence with current salary. I request you to please allocate me a Government Quarter or Government Flat in Kerala city. I will be thankful to you. Furthermore, I will fulfill all the requirements for Government quarter like rent, maintenance and utility bills etc on my own. 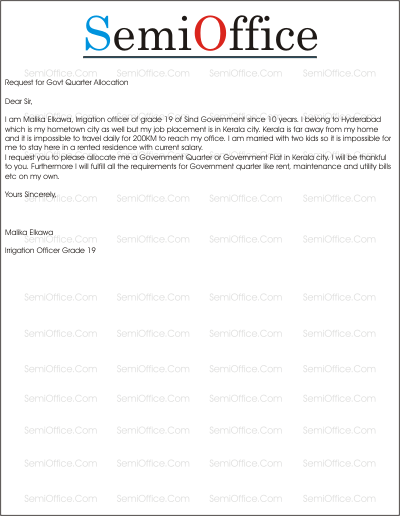 I am writing to you because I would like to submit an application for a government house. My name is Suyash and I work as a passport manager in her majesty’s passport office in Peters-burg. I am a very hard worker and I love my job. I would like to get this house because I am the only person my father has to look after him if I am not able to look after him then he will have to go into a care home and I can’t afford that. I also can’t afford to get a home by myself or rent with the high prices each month as my job is not high paying. My father has a sleeping disorder called insomnia and this means that he can’t sleep or when he does he wakes up in cold sweats shacking from night terrors. My current home if only fit for one person and with my father’s condition it is all the more difficult coping in this house. If you helped me with a government house then the rent would be manageable and I would have more room to cope with my father. Please help me I hope that you consider me for this and grant me this break. As you know I got married in October. Now I have plan to move my family Bangalore from New Delhi. Currently I am leaving with bachelors in a govt flat. It is not possible for me to stay in a rented house privately with my current salary. I request you to please allot me a family quarter where I can stay with my wife. I can fulfill all the utilities, bills and other expenses for govt account. Most humbly it is stated that I am an employee of lower cadre (clerical grade II) in this company. I have a family comprising six members to support including my parents. I cannot maintain a private residence on my own with my current salary. So, I request you to kindly allocate a family quarter for me. I will be very grateful you for your king approval of my request. It is humbly stated that I am an employ of Civil Courts. I am appointed as a peon for honorable justice. I have been living in a house of rent for last ten years. I am paying 5000 to owner. My per month salary is 12000 which is not enough to manage with other expenses .I request you to issue me a government house so that I can manage all the basic needs of life sufficiently. I will be highly thankful to you for your kind attention. Any one can inform me regarding the Procedure for allotment Rules (Official accommodations) at Peshawar 1980 alongwith its ammendments, please. Sir I was working in a govt school as office subordinate. I wish to stay in govt quarters how will I apply and what is the procedure please tell me.